C# Camera SDK: How to implement frame capture from an USB camera in C#? This lecture will make you successful in capturing frames from an USB camera in C# using the Ozeki Camera SDK. To succeed, OZEKI Camera SDK has to be installed and a reference to OzekiSDK.dll has to be added to your Visual Studio project. There are many ways to use the frame capture function effectively. Frame capture is the ideal option for those who wish to examine the security of their home, office, builiding, industry, parking area or any territory where a camera is placed. It is useful if you want to create flowcharts using video records as the source of data or when you wish to conduct a laboratory experiment where you have to record the alterations on a given timeframe. For example, if you wish to examine items (tools, food, etc.) which are placed on a belt, you can capture the needed frames from the stream of the camera and you can view the images in all details. 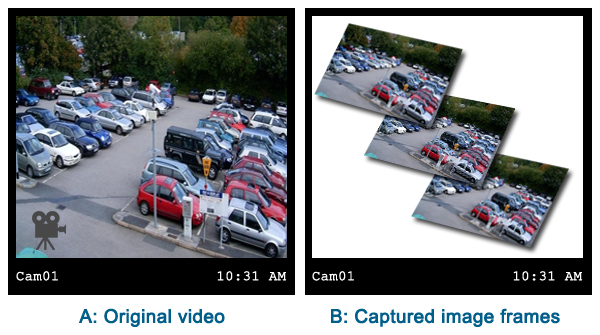 Frame capturing is a fantastic solution for image analysis. This function provides effective help in the case of using surveillance video systems in shops, hospitals, banks or in the food industry. With the help of frame capture function you can determine the number of images coming from different cameras. You can provide a time interval which determines the time between the arriving of the 2 frames or you can provide an FPS (frame/sec) value which determines the amount of frames that should be sent by the camera in a second. This function can be used with USB, IP and ONVIF IP cameras as well. The provided frame rate cannot be higher than the frame rate which can be handled by your device. IsRunning - It is a logical type indicator which indicates whether the frame capture function is running or not. OnFrameCaptured - This is an event which is called when a new frame arrives. With the SnapShot which can be got from the parameter we can save the incoming image to our computer. Stop() - with this method we can stop the controlling of the number of frames and the image sent by the camera will be continous again. We can determinate the time difference between the arriving of the 2 frame rates in three ways. The time interval can be changed during the operating. <Button x:Name="ConnectBt" Content="Connect to web camera" HorizontalAlignment="Left" VerticalAlignment="Top"
<GroupBox Header="Frame capture" HorizontalAlignment="Left" VerticalAlignment="Top"
<Button IsEnabled="False" Name="StartBt" Content="Start" HorizontalAlignment="Left" VerticalAlignment="Top"
<Button IsEnabled="False"  Name="StopBt" Content="Stop" HorizontalAlignment="Left" VerticalAlignment="Top"
<Button IsEnabled="False" Name="DisconnectBt" Content="Disconnect from web camera" HorizontalAlignment="Left" VerticalAlignment="Top"
With the help of this guide you will able able to implement the frame capture function to control the number of images from the camera to see as many frames as you want. 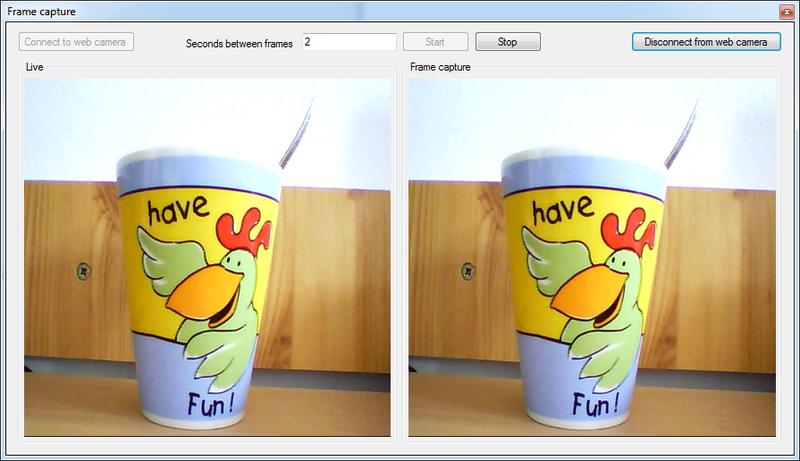 You can specify a time interval between two frames appearance (in seconds). This function works with USB, IP and ONVIF IP cameras as well. What devices are compatible with this frame capture function? You can use the frame capture function of the Ozeki Camera SDK with any device which has a video stream. For example: web cameras, IP cameras, .avi etc. What is the maximum resolution of the frames that I can capture with the Ozeki Camera SDK? You can capture frames with as high resolution as you wish. I cannot capture the frames on the basis of the provided time interval. Why? In this case the video source does not send the frames. Please verify whether it is connected appropiately.